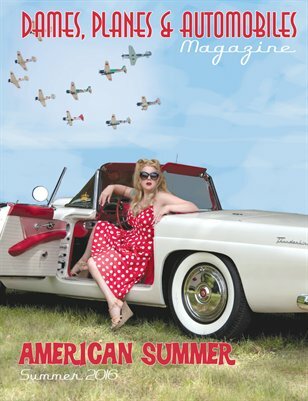 DPA Summer 2016 Issue "American Summer"
The Summer 2016 Issue of Dames Planes and Automobiles Magazine theme is “American Summer", a celebration of warm weather, beach frolicks, car shows, and all-around outdoor fun. Featuring lovely dames, classic planes, car show coverage, pinup contests, and features on Military history. With the photography of Shotgun Pinups, Jess Wright, Hollow Moon Photography, Ric Frane, Marc McGarrett, Canteen Cowboy, and more! As always, safe for work and family - friendly! Remember, a portion of our proceeds for each issue goes to groups supporting our veterans and active military and their families! Note: Our online publisher does not allow full preview of this publication, but we post teasers of each issue on our Facebook page.